Hello and welcome to Day 2 of my single layer hybrid cards week. 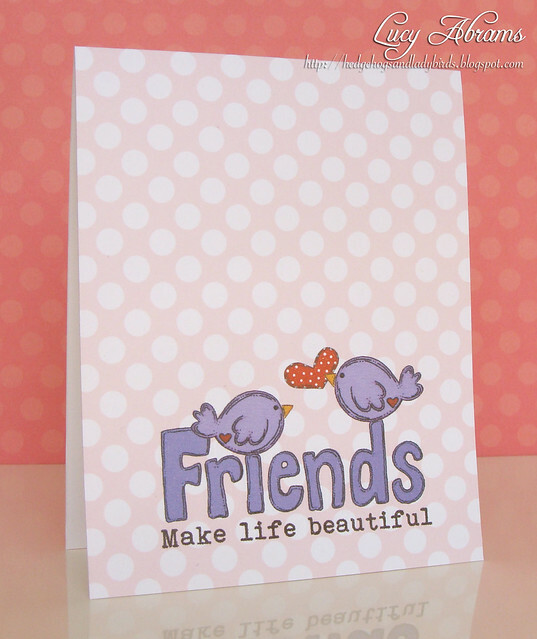 Today's card was created using a sweet sentiment and bird stamps from Shanna Vineyard's sweet Home is Where the Heart Is digikit. First, I imported my background paper, which is from THIS fab Pink Petticoat digikit. Then I imported my sentiment, bird and heart, all from the Home is Where the Heart is kit. The sentiment was layered over the paper. Then I copied and pasted the bird, flipping one so I had a mirror image version. I layered the birds over the paper, making them appear to be sitting on the letters of the sentiment. Finally I added the heart, making sure it appeared behind the bird so the bird looks like it is holding the heart in its beak. Love these cute images. More to share so I'll be back soon. Love this color combo! Those birdies are adorable!